A very busy meeting for us at Northampton. F1s, Minis, and V8s are all on tonight. We left a bit earlier than usual as Phoebe needed a run in her V8. The damage she had last year had not been touched over the winter, it was only Thursday evening that we got round to looking at it. She looked pretty good in practice, and was pleased when it started to rain as wet Tarmac is her favourite. 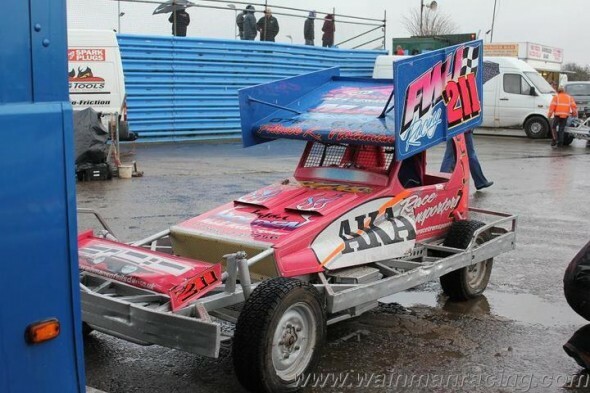 Anyway the meeting gets underway and young Frankie is out for heat 1. He doesn’t seem his usual self and the car is mis-firing. After just two laps he’s parked on the middle. Phoebe’s first race of the season is next, and she didn’t disappoint! She managed to avoid various pile ups and looked a pretty quick as she made her way through the pack. She crosses the line in second place. It’s time for the F1s now. The track was wet and the car felt good. A few lower grade drivers get away, along with Paul Hines, and I finish in fifth. Young Frankie is back out. We’ve swapped his distributor cap and rotor arm and he seemed to go much better, taking a 3rd place. Phoebe’s carb flooded up at the start in her second race, so she ended up at the back of the blues. She managed to pass all the other blues and crossed the line in 5th. 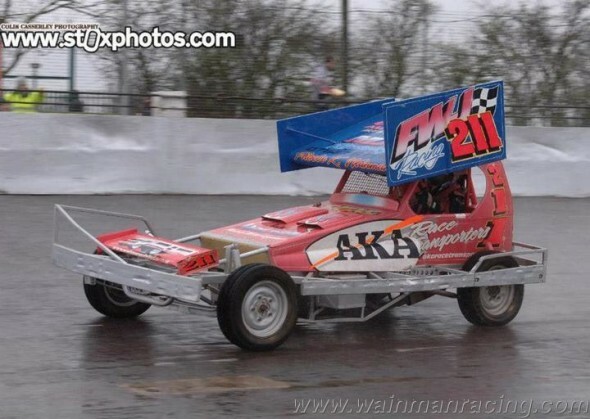 In my second heat, I struggled a bit with my tyres as the track started to dry out. I’d altered the suspension for this race but it wasn’t as good. But I still managed a top 10 with seventh place. The Ministox final next. Frankie is going well in this one. He gets into third place, but gets spun out on the last corner. His car restarted but he couldn’t get reverse, so that’s where he stayed. There was no Grand National so that was his meeting done. In Phoebe’s final, she got tangled up down the straight and she ended up facing the wrong way, so the yellows are out for her. Her race is over and she’s towed off to the infield. The V8 Grand National, and Phoebe gets off to a good start. She catches up to the yellows and hits them hard enough to pass. However, on the next bend she gets launched quite hard in the fence, and once again her race is over. She is a bit winded and has a sore arm, but she’s okay. It’s time for the F1 Final, and the track is drying up a little. It was a fantastic race between 259, 321, 2, 150, and myself. Ed passed and managed to gain some gound leaving the rest us to slug it out. I came second and Paul Hines 3rd. I think this race was enjoyed by all! So as the team get on with loading up the V8 and the Mini, I get strapped in for the Grand National. It’s another hard race, and it’s hard work trying to catch the lower graders. I finish in ninth. A very busy meeting indeed. 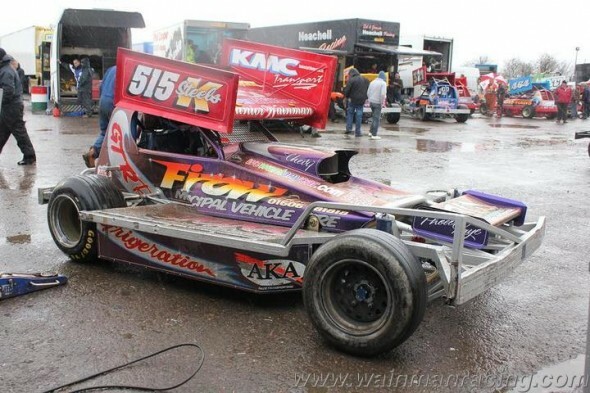 We get back late, but no lie-in tomorrow for Team Wainman as young Frankie is racing at Barford. Not many photos from this one, the conditions were far from ideal! Thanks to Martin Fitzgerald and Colin Casserley for these.